See how to create a lesson from your organisations existing SCORM 1.2 content. 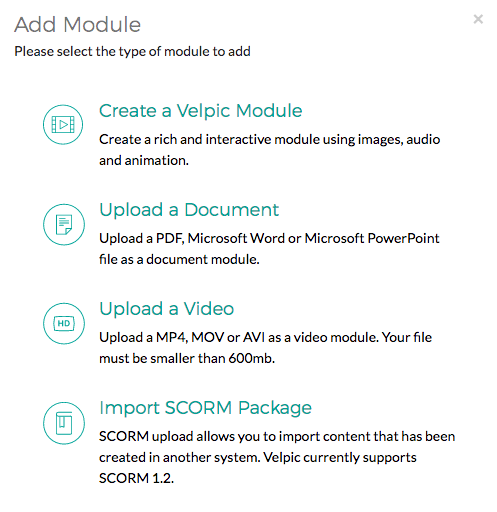 Velpic offers support for SCORM, here are a few things to keep in mind when adding this content. SCORM 1.2 Compliance - All SCORM content in Velpic must be compliant with SCORM 1.2 - http://scorm.com/scorm-explained/technical-scorm/run-time/ We do have plans in our roadmap to support SCORM 2004 and TinCan but have no timeline on a launch date for this yet. Embedded Video - For the best experience for your trainees, we recommend using Velpic's Video modules or video slides to stream video content rather than embedding video into SCORM lessons. We recommend not using any learning content that contains Adobe Flash - Many browsers are beginning to drop support for the Adobe Flash plugin due to security concerns. Once support is completely dropped any content created using Adobe Flash assets will not be usable. Mobile support - Currently SCORM packages uploaded to Velpic are not available via the Velpic LEARN mobile applications on Apple and Android devices. This content is only available for playback via web browsers. First, you will need to request the SCORM feature from the velpic customer service team. Either chat with us (bottom right) or email team@velpic.com. Once you have received access to this feature. If you see more than one option, select "Module Lesson"
In the resulting pop-up you should now see "Import SCORM Package"
Select the SCORM zip file from your computer or Drag an drop the file to upload. Once selected the SCORM package will be uploaded and processed and will appear as a module in this lesson. You can now continue to edit the lesson, or select "Publish" to publish the lesson with just the SCORM module.